Sometimes for feature analysis you simply need a scatter plot to determine the distribution of data. Machine learning operates on high dimensional data, so the number of dimensions has to be filtered. As a result these visualizations are typically used as the base for larger visualizers; however you can also use them to quickly plot data during ML analysis. 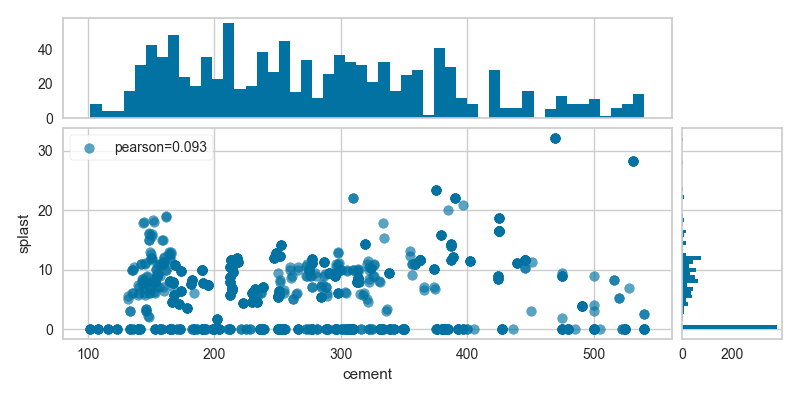 A joint plot visualizer plots a feature against the target and shows the distribution of each via a histogram on each axis. The joint plot visualizer can also be plotted with hexbins in the case of many, many points. JointPlotVisualizer allows for a simultaneous visualization of the relationship between two variables and the distrbution of each individual variable. The relationship is plotted along the joint axis and univariate distributions are plotted on top of the x axis and to the right of the y axis. This is inherited from FeatureVisualizer but is defined within JointPlotVisualizer since there are three axes objects. The name of the X variable If a DataFrame is passed to fit and feature is None, feature is selected as the column of the DataFrame. There must be only one column in the DataFrame. The name of the Y variable If target is None and a y value is passed to fit then the target is selected from the target vector. estimator used if scatter is selected for joint_plot to determine the type of best fit line to use. Refer to Yellowbrick.bestfit for types of estimators that can be used. cmap string or matplotlib cmap to colorize lines Use either color to colorize the lines on a per class basis or colormap to color them on a continuous scale. Sets up the layout for the joint plot draw calls draw_joint and draw_xy to render the visualizations. Draws the visualization for the joint axis.